Here we see the USS Franklin (CV-13) on fire after being hit by two Japanese bombs on 19 March 1945. The circle outlines three crewmen waiting for rescue. The USS Franklin was hit by two bombs on 19 March 1945 while operating off Kyushu. The bombs penetrated the hanger and exploded in the middle of fuelled and armed aircraft, causing a series of explosions. Fuel vapour from the after avgas system exploded a few seconds later. All but two of the men in the hanger were killed. 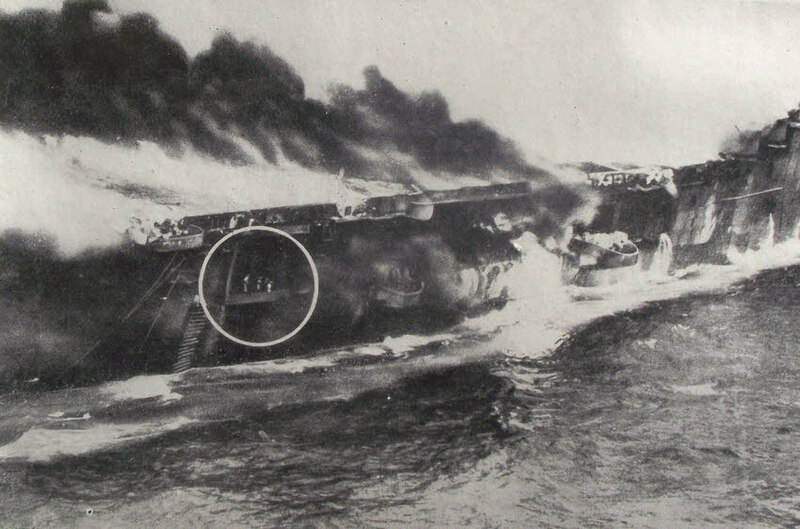 Another thirty-one fully armed aircraft were on the deck and the shock caused them to crash into each other, catch fire and cause more explosions. Some of their weapons dropped into the hanger causing more damage. A total of 724 men were killed and another 265 were wounded. The ship was saved by the armoured hanger deck which protected the machinery spaces below. The damage was later described as the most serious survived by any US ship during the Second World War. The Franklin managed to reach New York under her own power. She was repaired, but never returned to action.